true. 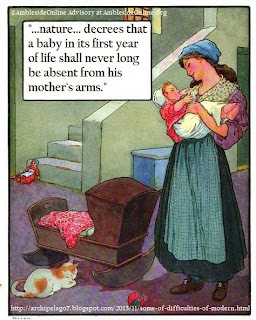 It may sometimes by laziness, or love of pleasure, that makes the modern mother hand over her children to the care of others, but it is also true that the more conscientious a woman is the more clearly she will see her own deficiencies, and dread the consequence of her possible ignorance or negligence. 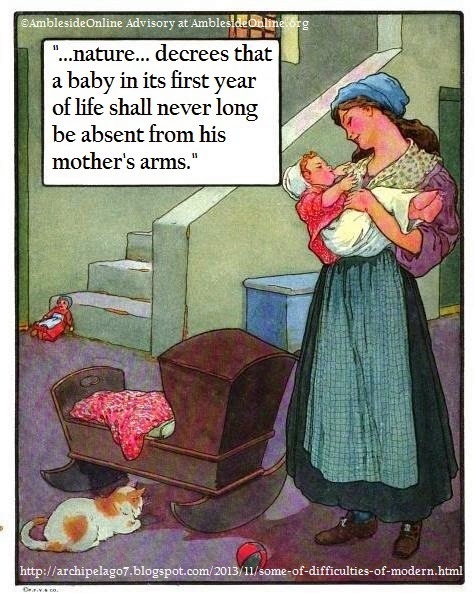 She may feel most strongly all that a mother ought to be, to her children, and she may most earnestly desire to do all that she can for them, but if she is perpetually being told that there are others more competent than herself to perform each individual duty in the end, she is apt to believe it. If this is true in health, it is even more insisted upon in illness. Through most of our childish complaints, our mothers nurses us, but the habit of calling in a hospital nurse, the moment there is any serious illness in a household, grows every year. It may be a wise practise, I am not here prepared to defend or to oppose it, but it certainly does take from mothers almost their last definite opportunity of tender intimacy and personal devotion. The more dearly a woman loves her children the more earnestly she desires to give the best of everything, but is it not a possible contingency in the present day, that a child who has had the most excellent nurse, and perfect kindergarten and ideal school may yet, by them, be robbed of the best of all- that complete and tender union with his own mother, which only very close personal contact in his early years can assure. The habit of turning direct to the mother for help and sympathy and counsel is one that very few will undervalue, but it is a habit that must have taken deep root in early years if it is to withstand the strong natural reticence of English nature in later life. 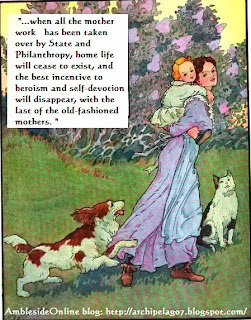 "Love grows by what it feeds on," But if a mother has neither fed, tended, taught, nor nursed her children she has lost much of the natural food of love, and there seems so little room for her in the children's lives that the tie between them may easily dwindle to a mere sentimental one which will be of little practical value in later years, and she may come to feel, with some bitterness, that the very unselfish tenderness, which should have been expended in personal devotion to her little ones, has been used as a motive power to persuade her to stand aside and let others take her place. 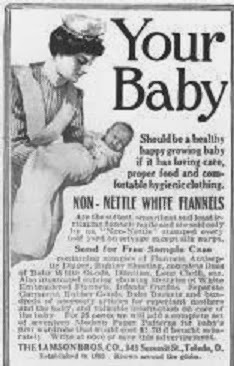 This demand "to stand aside" for the good of the child is being made not only on the mothers in our own rank [I believe the upper middle classes and above, WLC], but of late the same process is strongly urged for the children of the poor; it is not long since the Westminster Gazette published a series of very eloquent appeals called the "Cry of the Children." These letters pressed for the wholesale removal of slum children to the country, where they might grow up amid healthy surroundings, with foster mothers in cottage homes. Now, green fields, and fresh air, and birds, and flowers, and country food are all good and excellent things, but I venture to think they are not for one single moment to be weighted against a mother's love, and when we talk of "taking the children back to nature" the last lesson we should learn from her would be to part the little ones from those who gave them birth. The heritage of a poor child in a great city is but a dark and pitiful one, but I think those who know it best would be the first to acknowledge, that often its one glory is the beautiful and unselfish devotion of the poor mother. It is perhaps the one great compensation for the children of the poor, that they alone may fully know how much their mothers loved them. The rich mother may do much for her children, but she is not called upon to go hungry that they may be fed, nor cold that they may be warm, nor to work sixteen hours out of the twenty-four, in order to keep the home together, and through the cold and hunger, and unceasing toil are evil things, the love and heroism that they give rise to may be more beautiful and more valuable to the children's hearts, than all the sweet sounds and sights of country life." A little more than a year ago I graduated from college, married my best friend, and moved to a new city. The year since then has been one of transition: from the life of a high school and college student to the life of a married, working adult. It's been a challenging year, to say the least, but rich and rewarding as well. It's also been confusing. When I was first invited to write a blog post about life after a Charlotte Mason education, I didn't have the slightest idea what I could say. Life has moved faster than my ability to reflect on it or make sense of it. And things are still changing. For that reason, most of this blog post will be about the transition itself. In a lot of ways, my transition into adult life has been pretty standard. I graduated from high school, went to college for four years, and got a degree. Now I'm married, I live in the city, and I have a 9-to-5 job at an office. I see friends on the weekends, I watch TV in the evenings, and I go to church most Sundays. I've been having a minor quarter-life crisis, but I also have a lot of exciting new opportunities. Sounds normal, right? And, in a way, normal is good. It means my education "worked." At twenty-three years old I am a gainfully employed, law-abiding, functioning member of society. 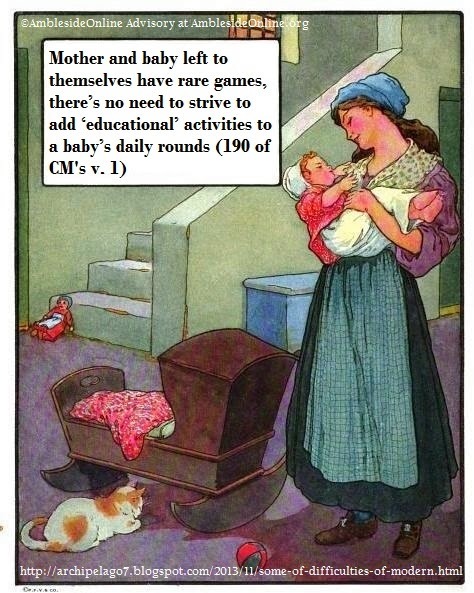 I pay my rent on time, I play well with others, and I even have hobbies--all without ever setting foot in the public school system. Of course, there's more to life than jobs and hobbies and a social life. But I would call this a minor success for home education. That's not to say that the transition has been completely smooth. It's been challenging in a lot of ways. 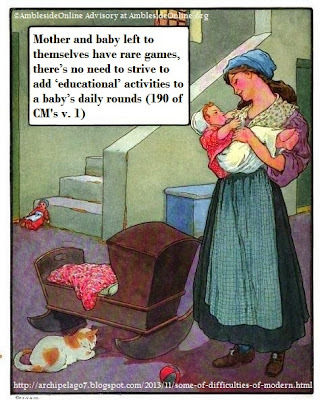 In fact, in one area I think my Charlotte Mason upbringing has actually made the transition harder. Let me explain. I work in the office of a large internet company, answering emails from customers. The work is easy but repetitive. Charlotte recommended short lessons and varied schedules to keep students' attention from flagging, but none of that is built into a standard work shift. And let me say it now: whatever living ideas do for the mind, repetitive work does the opposite. For the first month or two at my current job, I came home in the evenings feeling like an empty shell. My energy and attention and creativity were sapped. All I wanted to do was sit in front of the TV or go to bed. The strangest part, at first, was that none of my co-workers seemed to notice. I didn't hear them complaining about how repetitive the work was, or how hard it was to pay attention for hours at a time, or what effect the long, dull days had on their imaginations. After a while I realized: they took all of that for granted. As a CM graduate I expect my work to be fulfilling and to demand my full attention. My public-schooled co-workers, on the other hand, are accustomed to buckling down for long stretches of dull work. They have coping strategies, whether that means zoning out or listening to music or watching YouTube videos in the background. I'm not used to sitting inside at a desk for most of the day, but most of them have probably been doing that since they were six. I'm not used to work that leaves my mind and spirit starved for real food. For them, it seems to be normal. If that's normal, my education left me woefully unprepared for normal life. Now, maybe that's a bad thing. My lack of conditioning has made for a tough transition, one that--heaven and my wife know--I haven't always handled gracefully. Then again, maybe it's a good thing. I have a different expectation of what "normal" means. I have a full life outside my job, and I've found my own ways to cope with the work itself. I'm allowed to wear headphones while I work, so I've been listening to all sorts of material: music, audiobooks, podcasts, lessons and tutorials on YouTube, the daily news. To top it off, I come home every evening and give my wife a narration about whatever I listened to that day. I've also been doing a lot with music. Like most Ambleside Online students, I grew up reading great literature and listening to great music, and I fell in love with both. I entered college as an English major with music lessons on the side. Then, about halfway through my degree in English, my love of music turned into a passion. I finished the English major, but I added a music minor, and I decided that I wanted to pursue music seriously. After graduating, I started teaching myself orchestration and arranging using any means I could get my hands on: online articles, YouTube lessons, orchestration manuals, and lots of careful listening to orchestral music. When we moved to Boston, I joined a couple of choirs and found a part-time position as an accompanist. Soon I had the opportunity to arrange a piece for one of my choirs. And then another piece. And another. Since then, I've been blessed with a flood of opportunities. I've arranged pieces for choir and orchestra. I've conducted rehearsals and performances of my own arrangements. I've written original compositions, including a song commissioned for a friend's choir and the theme for another friend's web series. I've led a recording session and played in an orchestra. Currently, I'm taking voice lessons, singing in an opera, directing a choir, and scoring an indie film. I'm also researching music schools and planning college applications for a return to school. Music is a big part of my life now. But my interest in music didn't come out of nowhere. The seed of that relationship was planted as a very young Charlotte Mason student, listening to classical music on the radio and doing composer study and taking piano lessons. The habit of attention and love of learning that I developed as a CM student allowed me to continue pursuing music in college and after I graduated. And that pursuit has opened a wealth of new relationships, experiences, and opportunities. Once you make a habit of learning, it's hard to stop. I found this to be true with music, certainly, but in my experience it applies to everything. The attitude of attention, once acquired, becomes a constant part of who you are and how you approach the world. The discipline of education really does become a life.